A simple, cost-effective fax solution for low-volume and mid-volume traffic. 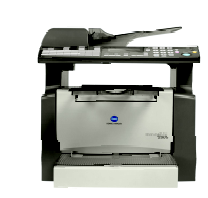 With high-speed Super G3 transmission, to keep up with busy fax workflow. Fast 16 ppm print/copy output. And TWAIN color scanning, for greater versatility. A simple high-speed solution for exchanging information and images in real time ? perfect for small and mid-sized businesses, branch offices, medical service providers and others who need quick communication with collaborators and supervisors. 16 ppm printing and up to 600 dpi for high-resolution image quality that makes text more legible, fine details and handwritten notations crisper and clearer. Color scanning support allows you to scan color originals as well as black-and-white originals; TWAIN scanning lets you scan documents directly to your PC. High-speed Super G3 Fax with built-in modem transmits at up to 33.6 Kbps; ultra-fast scanning in as little as 2.5 seconds per page. Standard 16 MB memory allows you to store up to 350 fax pages. High-quality copying with Micro-toning for superior image quality, Text Mode for more legible text, Photo Mode for smooth halftone reproduction. Convenient fax functions include 100 Auto Dialing locations, 32 One-Touch Dialing locations, 142 Broadcast locations, F-Code support, Timer transmission and more. High paper capacity including 50-sheet Automatic Document Feeder, 200-sheet output tray, 250-sheet paper cassette, and optional 500-sheet second paper cassette unit.